To live far away from home, in a different community and culture, and contribute towards a nation’s rebuilding after a disaster requires courage, character and determination for any young person. In Nepal’s traditionally patriarchal society, it can be especially challenging for young women to seize such opportunities. On top of this, success becomes even more challenging within an industry such as engineering which is still perceived in many countries as a “man’s profession.” After Nepal was struck by the disastrous earthquakes in 2015 however, many Nepali women engineers have come to the forefront of reconstruction, significantly helping homeowners in rebuilding their houses and strengthening their affected communities. As we mark International Women in Engineering Day 2018, to celebrate the contribution and achievements of women engineers across the globe, we bring to you the story of two young and inspiring women engineers from Nepal. Both joined Build Change as Engineering Interns after recently graduating and immediately moved to live and work far away from their homes, in the rural community of Jiri, on the pathway to Everest. These strong engineers contribute towards the reconstruction process through a National Reconstruction Authority (NRA) Surakshit Ghar (Safe Home) Technical Support Centre (TSC), established to provide free technical assistance and drawings on earthquake resistant house designs to homeowners across the major earthquake affected districts of the country. Raksha interacting with homeowners about their newly built earthquake resistant house with drawing support from the Jiri TSC. “I was literally like a mother’s little daughter before I came and started working here,” says Raksha. Having come from a very protective family background, she recalls that the decision to go and live in Jiri for 6 months was quite challenging, and even scary for her. “When I think of it now, it’s funny how I made many excuses not to go there, but everyone including the staff at Build Change as well as my family members encouraged me to explore this new opportunity and push myself out of my comfort zone to learn new skills” she says. Raksha is responsible for providing technical advice and assistance to homeowners on earthquake resistant housing technologies and house designs, including free house drawings, design modifications as well as to recommend suitable house designs for homeowners as per their individual lifestyles and economic circumstances. 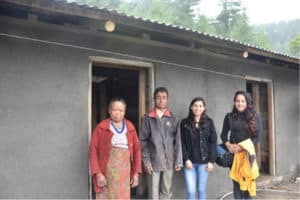 “I have gained so many practical skills; not only did I learn about reconstruction and earthquake resistant housing technologies, I also learnt about how building designs can be applied in different contexts. I also got a first-hand experience on rural lifestyle and rural housing,” she remarks. Raksha agrees that working in the field with the communities can have its own challenges. “Sometimes it becomes hard to make homeowners understand the technical aspects of earthquake resistant housing technologies and house designs. On several occasions, a large group of people have come to us at once, seeking technical assistance for their rebuilding needs. It becomes difficult to manage the crowd and deliver quick and efficient service because of the size of these large groups.” However, these challenges seem minimal when compared to the huge contribution that she is making to the field of reconstruction, and this sense of service and contribution is what inspires and drives her to move ahead with limitless enthusiasm and determination. From a recent graduate, who had yet to experience the challenges of living in a rural community, Raksha has now emerged as a confident, independent and mature female engineer, who is not afraid to take new challenges in life, who can easily connect with rural lifestyle, who can empathize with the needs and challenges of earthquake affected communities and who is determined to give her best to make their lives better. She plans to gain more experience in the field of reconstruction, after which she plans to do her master in structural engineering. Pratiksha guiding a homeowner on choosing a suitable house design for her family. Pratiksha’s story unfolds slightly differently. Ever since her childhood, she had wanted to become an architect. However, as time passed she developed more of an interest for civil engineering. Her family also suggested this path of study, so she chose to become a civil engineer. The phrase “Women are encouraged to apply” was what first caught her attention when she came across Build Change’s vacancy announcement for Engineering Interns. She applied, and got the job. Having lived away from home for a long time while undertaking her undergraduate studies in India, the decision to live and work in Jiri did not come with as much of a challenge, as it had been for Raksha. The beautiful landscape, friendly and supportive people as well as the homely environment of Jiri quickly won her heart and in no time, Jiri quickly became her second home. However, things were not so smooth in the beginning. “There were some people who had doubted our capabilities and tried to pull us down. However, over the course of time, we proved them wrong, we showed them our skills and impressed them with our work, so now they treat us with respect and even come to the TSC seeking for technical assistance and advice,” she says. She also explains how difficult it was for them initially to make the homeowners understand technical aspects of earthquake resistant housing technologies. “So we started adopting a two-way communication approach in which we tried to understand their needs, lifestyles and socio-economic contexts and provide them with a locally adaptable and affordable housing option accordingly.” This approach has greatly helped them deliver effective service to the homeowner and form deeper connections with them. “We understand their challenges and struggles; some homeowners travel hours and even days to come to the TSC; some are very old and physically weak. So we try our best to make things easy for them. In return, we get their valuable respect and support. The feelings are mutual,” she says. Pratiksha looks forward to these inspiring and proud moments, new challenges and learnings every day. 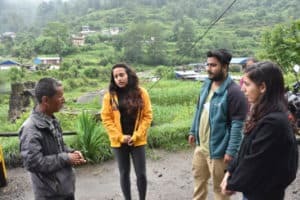 After gaining few years of work experience, she is planning to continue her further education, and help contribute towards Nepal’s development in a way that further challenges and develops her as an individual. Within the first 4 months of operation, Raksha and Pratiksha provided over 800 house drawings to homeowners through the TSC in Jiri alone. The highest record was 65 drawings delivered in a single day. Overall, there are currently 39 Surakshit Ghar TSCs operational in 8 earthquake affected districts of the country which have delivered over 5500 house drawings to homeowners so far. 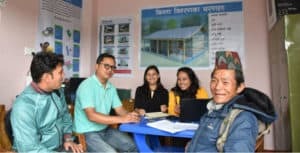 Raksha, Pratiksha and their colleagues are in the forefront of reconstruction across TSC locations such as Jiri, managed by Design Support Team Leader Ayusha Joshi (Architect) and Lead Structural Engineer, Liva Shrestha who oversee quality control of design information and implementation. A whole technical assistance platform led by women. Now let’s hear what our homeowners and government officials from Jiri have to say about Raksha and Pratisksha as well as the services provided by the TSC. Lal Bahadur interacting with Pratiksha and Raksha regarding the construction progress of his house. Khagendra (second from left) along with Raksha, Pratiksha and other community members in the TSC. Pratiksha, Raksha, Ayusha and Liva set an example for anyone aspiring to pursue careers in the field of engineering and reconstruction. These amazing women, along with the many other women engineers, builders, builder trainers, and homeowners we work with, are changing the world, one safer building at a time!